They're saying that we are going to get big time rain here in Southern California over the next few days. Apparently they've even started evacuating some folks north of where I live. Where I live there is not much threat from rain-caused disasters. We'll just get rained on and I can leave my sprinklers off for a few days. Besides, I rarely see the big rains they talk about on the news. We'll get a little bit of rain and hear about mudslides in other places. I'm happy with where I live in the respect that we don't get those events like fire, flood, and mudslide. You can count me as thankful for most things even when I wish they'd be some other way. With another birthday having passed I've begun to think about my own mortality. Recently a friend who had just turned 101 died. He was in pretty good shape until a few weeks before he died and then we didn't see him in church for a couple Sundays and then we get word that he died. I've got a good ways to go before I'm as old as that guy, but still I've known folks my age and younger just unexpectedly go. My father died at the age I just turned and so did my brother-in-law. That's just an observation that I can't help not ignore although I'm trying not to dwell on it too much. Although my most recent Battle outcome was predictable, I had hopes that the final result would not be so lopsided. 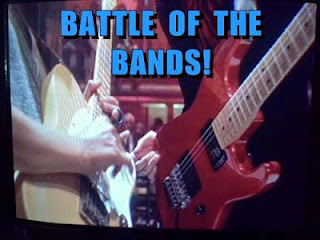 I was not surprised that most voters in my Battle picked the dreamy laid back sounds of Jamie Dupuis on the harp guitar. After all, initially this was my first choice. Such a wonderful cover of the Pink Floyd song "Comfortably Numb" and very aptly performed. Then, as in the case with all of my Song Battles, I continued listening to both versions repeatedly for many days. Jamie's version with the harp guitar and electric guitar I could listen to for hours--it's so relaxing. As I continued listening to this version I realized there are no surprises. That's why it's so comforting. While the version by Thomas, though initially somewhat disconcerting--"choppy" according to one voter--this version is filled with surprises. With each subsequent listening I discovered new little sounds I hadn't noticed before. The visuals were very persuasive as well. But the treatment of the song is wondrous to my ears. That's why my vote goes to Thomas Leeb. Not that it helps the outcome for him much. Jamie Dupuis ran away with this Battle. No fooling! 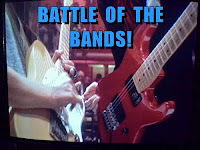 The next Battle of the Bands posting will be a sort of perfect storm scenario with the Battle coinciding with Easter, April Fools Day, and the opening of the 2018 Blogging from A to Z April Challenge. Now I need to hunker down and start composing those April posts. A big rain storm would keep me inside writing. Or maybe inside looking out at the rain. I love watching a good hard rain. What's the weather like in your neck of the woods? Do you ever ponder your own mortality? Would you like to make it to 100 years if you could stay relatively healthy? Cleaning Clutter would be a great blog theme. You could get rid of something every post and write about it. Now, three years after that exchange, I decided to run with this theme. I may not write everyday about getting rid of various items, but I intend to record my musings about the "clutter" around my house. Don't get me wrong--I don't live in a hoarder environment like in some of those television shows you may have seen. And I am at no risk of being buried for days under toppled stacks of newspapers and boxes. Things mostly look pretty normal around here, but there is still stuff we don't need anymore. But wait! Let me not get ahead of my theme. You'll have to come back on April 1st to see where I will go with this. The official title of my theme is "Cleaning the Clutter"--but it might not totally be what you think. Not always. There hopefully will be some interesting--and even helpful observations, but I will also be "tossing it out" figuratively as well as literally. It's business as usual. Just the way I like it. This Pink Floyd song comes from the album The Wall as well as the film of the same name. Like much Pink Floyd music, "Comfortably Numb" is dreamy and atmospheric, lending itself well to New Age sounding instrumental interpretations. With the Blogging from A to Z April Challenge coming soon, along with all of my other life challenges and concerns, I've been needing some laid back music to relax me. Comfortably numb sounds like a reasonable state of being when things come rushing down on us, while at the same time remaining vigilant with a sense of rational clarity in order to properly process it all. How about we get on with the music. In this Battle I've matched two somewhat similar presentations of the same song. Each artist has his own unique approach to interpreting the song so the question for you is: Which version do you like best? Listen and tell us in the comments. Canadian musician Jamie Dupuis displays his virtuosity on acoustic harp guitar and electric guitar with Pink Floyd's tune. You might want to just put this on a few times in the background for relaxation. I'm loving this version. Now calling L.A. his home base, Austrian guitar virtuoso Thomas Leeb has developed some nifty technique to play with a dazzling flair. Watching this video is hypnotic, but the mesmerizing effect is definitely enhanced by the music as well as the GoPro cameras on his guitar. I haven't gotten tired of this video yet. What do you think? It's now time to snap out of your reverie and cast a vote in this contest. Please vote. What's your preference between these two choices? Which song version do you like best? You don't have to know about music to have an opinion since it all comes down to your own personal taste. Don't forget to come back next Wednesday March 21st to see which song version wins this Battle. I've got to get busy preparing my posts for April. And maybe I can get rid of some stuff. Do you have any books about getting organized? What kinds of stuff is easy for you to toss out? What are the things you'd have a difficult time getting rid of? When I get too much on my plate I wonder if it would look bad to take some back to the buffet? Maybe not such a great metaphor for my post today, but I do have a full plate so let me get started. 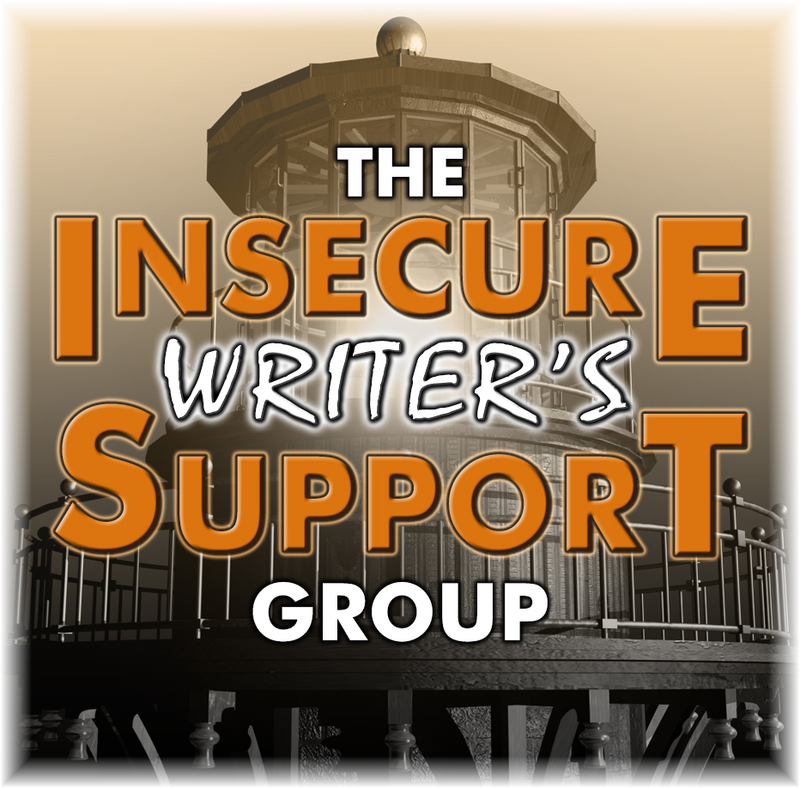 The co-hosts for the March 7 posting of the IWSG are Mary Aalgaard, Bish Denham, Jennifer Hawes, Diane Burton, and Gwen Gardner! March 7 question - How do you celebrate when you achieve a writing goal/ finish a story? I can't say that I've done much celebrating for achieving any writing goals since there hasn't been that much to celebrate. Tonight I'll celebrate finishing this post by going to bed--to bed far earlier than normal. The writing finishes I have of late are finishing blog posts and usually my celebration doesn't amount to much more than thinking up another post, reading, watching television, or something that I can do by myself since no one else feels celebratory when I've finished composing a post. Then there is the Blogging from A to Z April Challenge. That's a fairly sizable writing endeavor that is a relief to finish. But as with the other blog posts, when I'm done there are no fireworks or parties or anything like that. No, it's just business as usual in the world of blogging. It's coming soon! Did you see where the list is now open? You've still got a few weeks to decide if you are still mulling over whether or not to participate. Maybe seeing the colorful A to Z badge (once again created by the talented Jeremy Hawkins) starting to appear on other blogs will get you fired up. We'd love to have you join us again or for the first time. You can find the sign up list here. Often when I've reached the winner's announcement I'm ready to forget the song that's been in my mind in order to move on to the next one. This month not so much. The song "I Believe in You" from How to Succeed in Business without Really Trying is still running in my brain and I could keep it going for a while longer. However short of using the song again in my next Battle I'll settle for watching the film in the next couple of weeks and start focusing on the Battle that is to come next week. Next Battle on Thursday March 15th! I'll be combining my next Battle with my A to Z Theme reveal for 2018. I hope you'll join me again then. Did you sign up for A to Z? What makes you celebrate? What is your favorite way to relax after a day at work or some period of tension? Need some motivation? Have you tried listening to motivational speakers? I've got success program recordings by Napoleon Hill, Tony Robbins, and a few others that I used to listen to when I was driving. Whether it was for my fifteen minute commute to and from work or some extended trip, I would listen to these tapes over and over and over. Now I don't have a cassette player in my vehicle so I don't listen to them. At the time I supposed that listening to the content enough would make it stick with me and maybe it did. Probably so. Still, there are those times when I need a healthy dose of motivation, part of which is reassurance. The guy doing most of the talking these days is me talking to myself. If I'm not hearing something on the computer or seeing something on television that pushes me to action, then it's up to me to do the prodding. I know it's all worth it in the end. At least I think it is. I hope it is. This song popped into my conscious mind within the past couple of months--not sure how or why, but it just did. Since then it has been my obsession to use it in an upcoming Battle and today is the day. The message in the song is a motivational one: Have confidence in yourself if you want to succeed. That speaks to my own self perception of late. I guess that's why I've had the song on mental replay for several weeks now. When I'm leading up to a Battle, the song I'm going to use next tends to overtake my musical mind. This one has done so probably more than any song I've used so far. Come readers! I believe in you. Please vote. What's your preference between these two choices? Which song version do you like best? You don't have to know about music to have an opinion since it all comes down to your own personal taste. Do come back next Wednesday to find out who won this Battle. 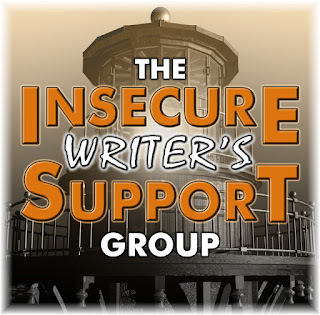 That will also be the day of the Insecure Writer's Support Group so you might want to drop in for that post as well. If you have not yet completed the survey at the Blogging from A to Z Blog site, please visit and help us with your input. A to Z sign ups open on March 5th. Do you need any particular motivation right now? Do you ever listen to motivational gurus? Have self-help books ever been helpful to you?